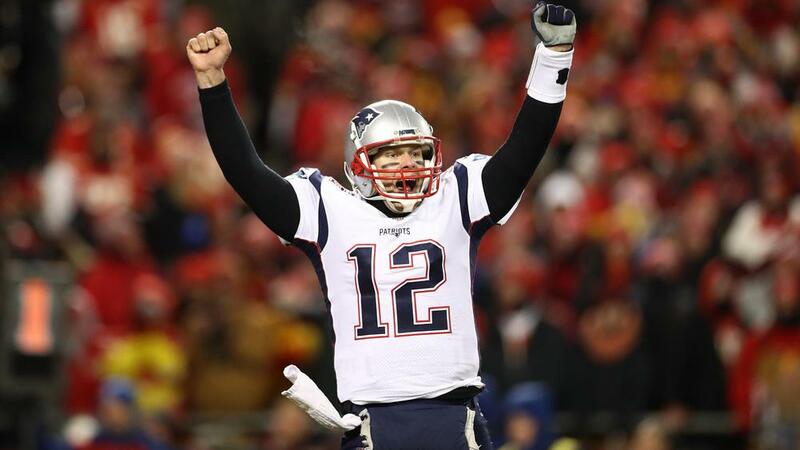 Tom Brady led the New England Patriots into a fourth Super Bowl in five seasons after a 37-31 overtime win against the Kansas City Chiefs on Sunday. An incredible AFC championship game went the way of the Patriots, who will face the Los Angeles Rams in Super Bowl LIII on February 3 in their third straight appearance in the decider. Brady completed 30 of 46 passes for 348 yards, a touchdown and two interceptions, and the Patriots did not even give Patrick Mahomes (16 of 31 for 295 yards and three TDs) a chance in OT. It came after a wild game that featured 38 points in the fourth quarter at Arrowhead Stadium. The Patriots made a strong start and a 15-play, 80-yard drive led to a Sony Michel touchdown in the first quarter. New England were on top and looked set to add to their lead, only for Brady to be intercepted by Reggie Ragland in the end zone early in the second quarter. But the Patriots would extend their lead before half-time, Brady finding Phillip Dorsett with a 29-yard touchdown pass. Kansas City got a response early in the third quarter through Mahomes' 12-yard pass for Travis Kelce, a drive set up by a 54-yard pass for Sammy Watkins. A 47-yard field goal from Stephen Gostkowski made it 17-7 Patriots before Mahomes and Damien Williams combined to bring the Chiefs to within a score. But there was controversy to follow. Kansas City thought they had a lead following a Julian Edelman fumble from a Dustin Colquitt punt, with Gehrig Dieter running in to score, but that was overruled after replays showed the Pats wide receiver did not touch the ball. But Brady was then intercepted when Edelman dropped a pass and the Chiefs capitalised, Mahomes helping Williams get in for another TD to take the lead. With three and a half minutes left, Michel rushed in for a TD to give the Patriots a 24-21 advantage, only for the Chiefs to respond. Mahomes' 38-yard pass to Watkins dragged Kansas City to within two yards and Williams rushed into the end zone. That gave Brady the ball with two minutes remaining and he delivered a six-play, 60-yard scoring drive as Rex Burkhead rushed in to give the Pats the lead. A 39-yard field goal from Harrison Butker forced overtime, but Brady led a 13-play, 75-yard drive to see New England to victory.